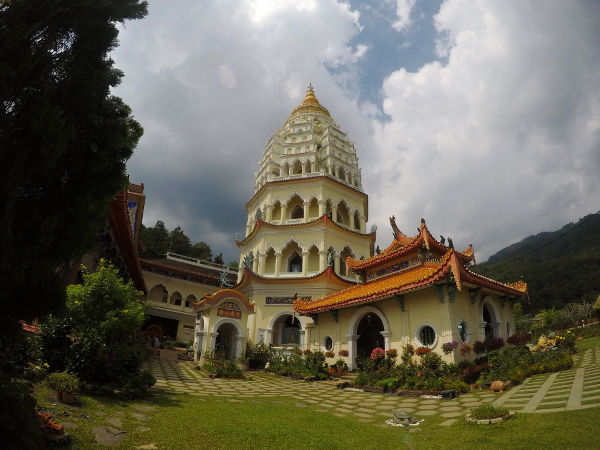 When you visit Penang, one of the Things To Do in Penang that you must do is visit Kek Lok Si Temple. We did, and we are very glad. It was awesome! 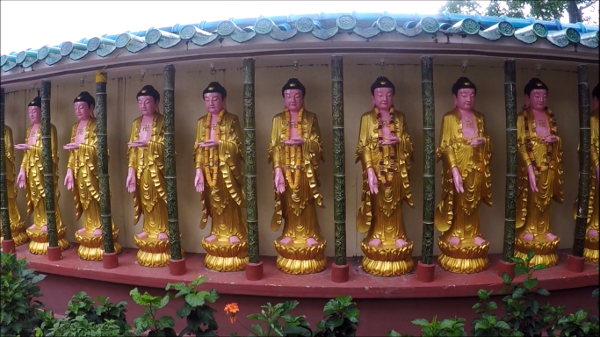 After a good breakfast of Penang Fried Kway Teow, we headed for the famous temple. It was a short and pleasant drive. 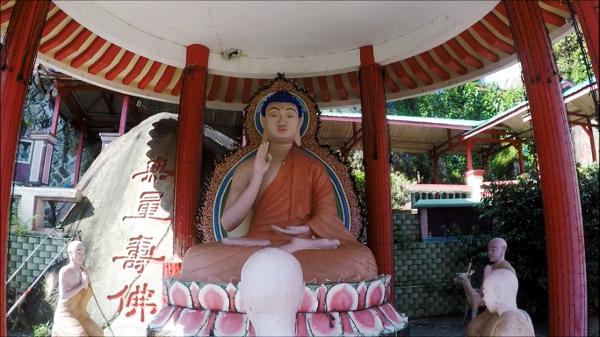 In this post, you will get to see a video of the amazing place, learn the history of this famous Buddhist temple, see the halls filled with Buddhas, Bodhisattvas and Divine Beings, and enjoy the breaktaking view from the top of Penang Hill where this temple resides. 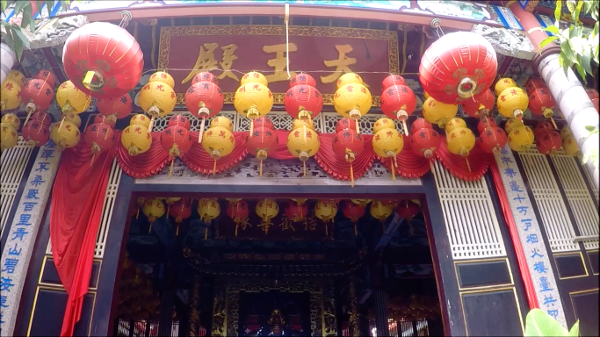 We enjoyed filming the many sights seen at this wondrous temple. 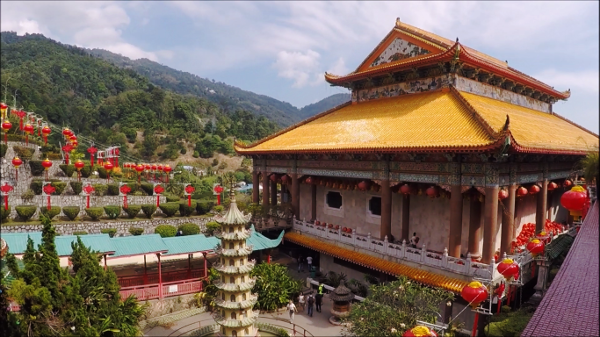 We started on the lower levels, on to the many halls on various levels, to the peak of the hill where the Giant Kuan Yin statue is, and also climbed up the Pagoda of Ten Thousand Buddhas to capture the magnificent view of Penang from above. This is one of the best known temples on the island. 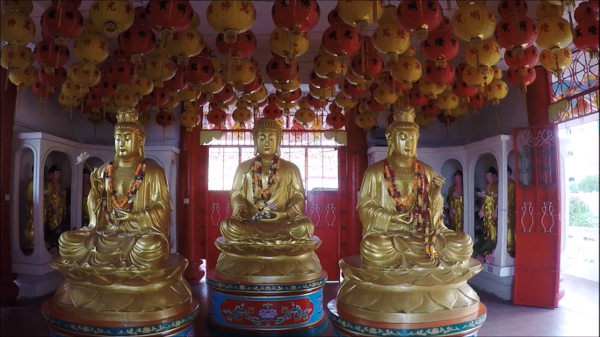 It can be said to be the largest Buddhist temple in Malaysia. 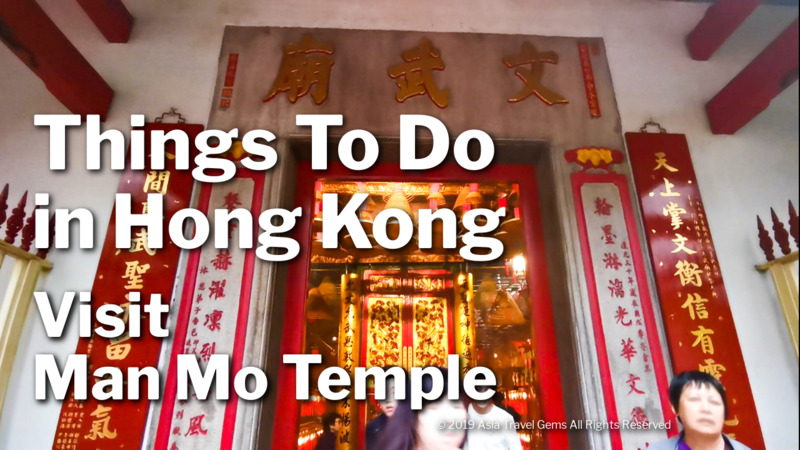 Actually, it is made up of a complex of temples and prayer halls that were built over a period from 1890 to 1930. There are two main attractions here. One is the Pagoda of Ten Thousand Buddhas. 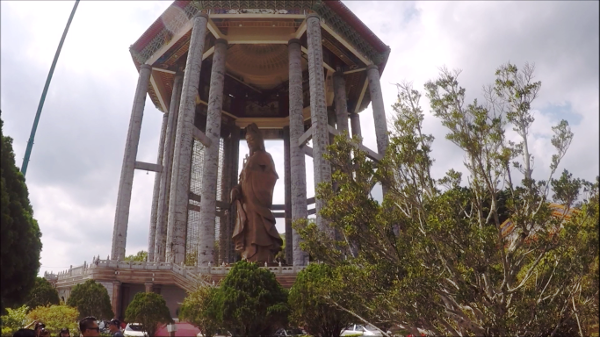 And the other is the giant statue of Kuan Yin, the Goddess of Mercy. There is more information about both below. One of the unique features of this famous place is that it showcases architecture and artwork from Mahayana and Theravada Buddhism. In doing so, they have displayed harmony in diversity. Tip: There is a lot of ground to cover. Visit first thing in the morning. This is the newer attraction at Kek Lok Si. It was completed in 2002. It is located high up on the hillside. 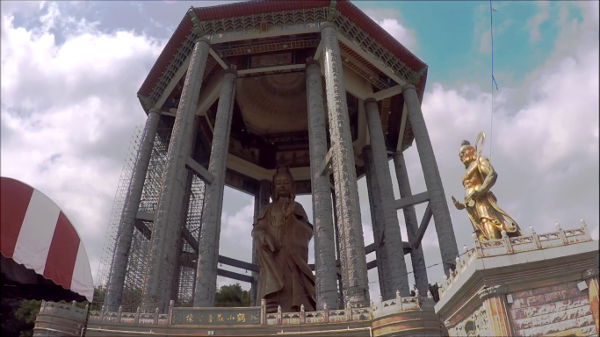 We were very excited to see this huge tribute to Kuan Yin, the Goddess of Mercy. When we were driving towards Kek Lok Si, we could already see it from afar. To get to the location, we took the inclined lift to get there. You need to buy a ticket to ride the inclined lift. Watch the video to see how. 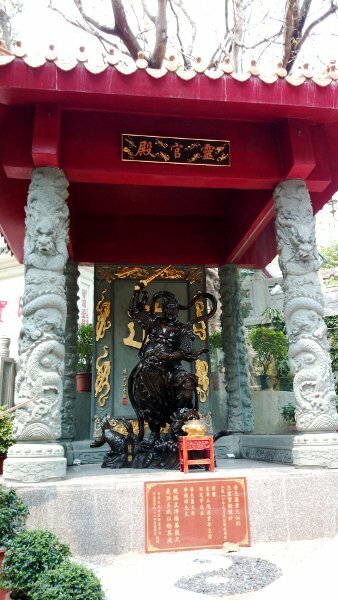 The statue of Kuan Yin, the Goddess of Mercy is made of bronze, and is 36.57 meters tall. That is about 120 feet. Wow! This makes it the tallest Kuan Yin statue in the world! When we were there, we could not resist the breathtaking, magnificent view of Penang. We just had to stop for a while, take a breath, and enjoy the scene before us. The other attraction, the Pagoda of Ten Thousand Buddhas was no lightweight either. Completed in 1930, this towering structure has continued to capture much attention from visitors since then. 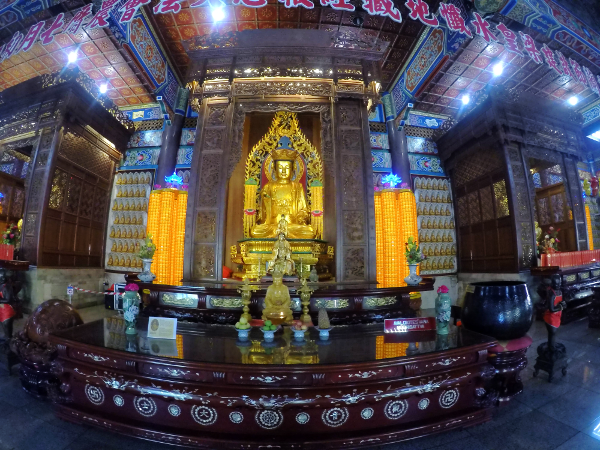 Within, there were ten thousand alabaster and bronze statues of Buddha. The pagoda itself is 30 meters (98 feet) tall. 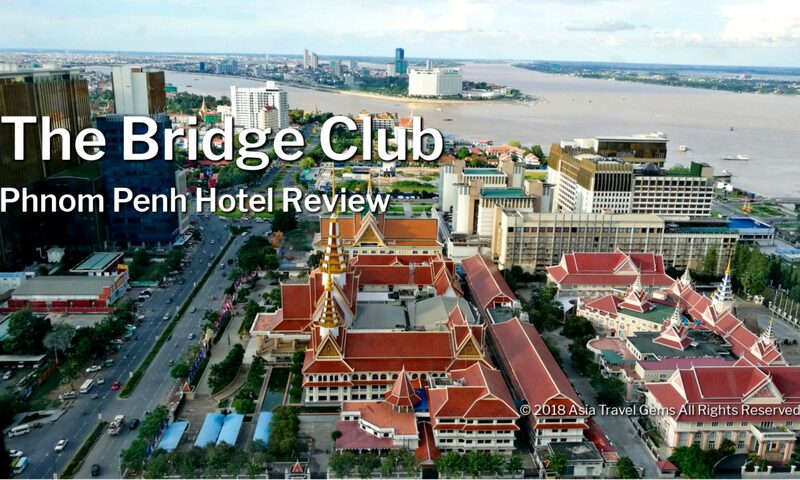 The architecture is a harmonious mix of Chinese, Thai and Burmese. 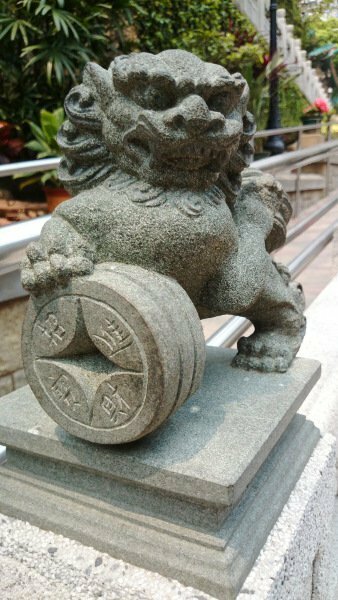 The octagonal base is a Chinese design. The middle tier has Thai influence. And the crown at the top is surely Burmese in origin. The mix represents harmony in religious diversity. It also reflects both Mahayana and Theravada Buddhism. On the ground level, there is a huge statue of Buddha donated by King Bhumibol of Thailand. That is why it is also known as Rama VI Pagoda. You can see an image of this statue in the video above. Before we explored the pagoda, we noticed a very beautiful garden next to it. 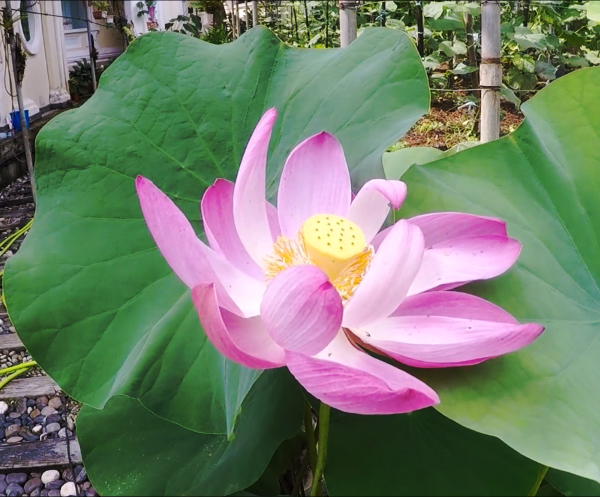 There were lovely flowers such as the lotus shown above. Plus, the landscaping was a sight for sore eyes. Do watch the video above to see the garden. From the top level of the pagoda, you will be able to enjoy a breathtaking and magnificent view of Penang Hill, and George Town. 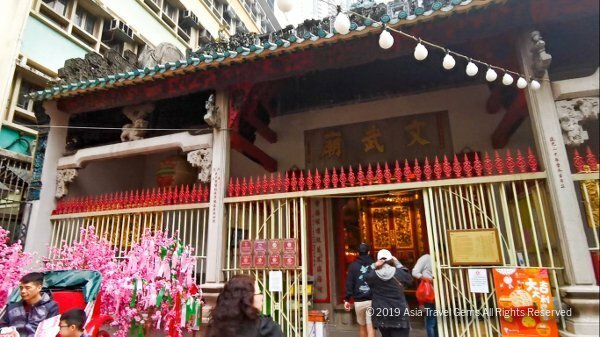 There were many prayer halls at Kek Lok Si. 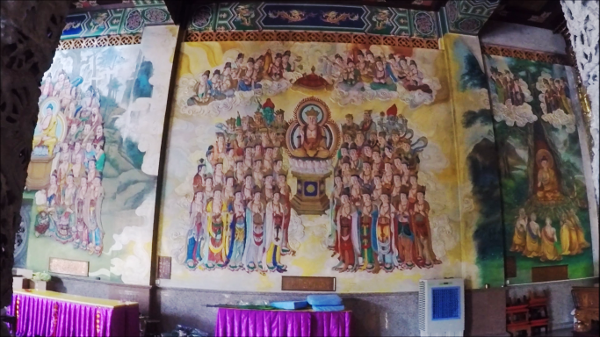 All filled with statues of Buddhas, Bodhisattvas and Divine Beings. Here are photos of some of them. To see them all, do watch the video above. When we first arrived, we found this prayer hall. There were 3 large statues of Bodhisattvas, all beautifully decorated. We also found a pretty garden that had this serene Circular Pavilion with a Buddha image. We roamed around. The place was like a maze. 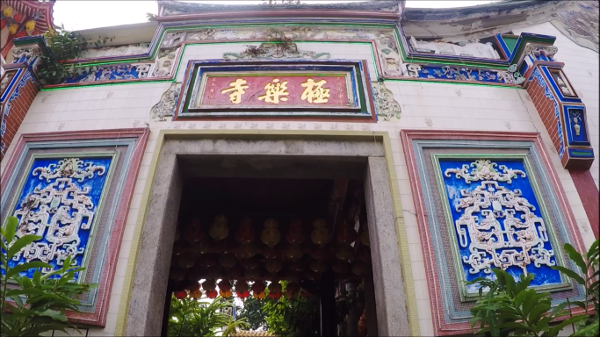 Then we found this small entrance with the sign that said in Chinese – Kek Lok Si. I love the deep blue colors! This was the entrance to one of the many prayer halls. I love how the many lanterns gave that extra touch, and made for such a nice photo. 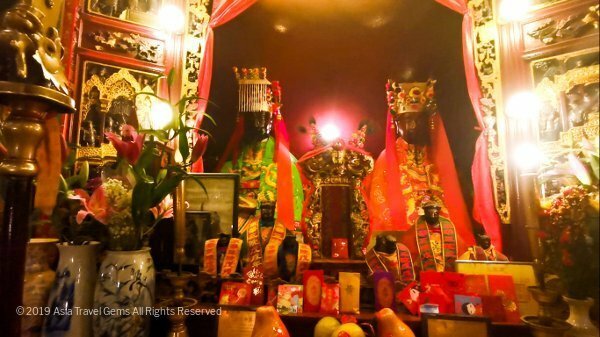 This next altar was actually on the same location as the Giant Kuan Yin Statue. So beautiful! The perimeter of one of the prayer halls featured statues of Buddha all along it. Simply astonishing! As mentioned, there were prayer halls that were Theravada Buddhism. * Tip: Look up! 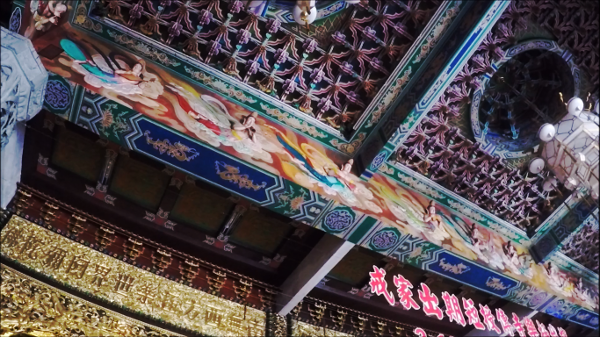 The ceilings are also filled with colorful and delicate artwork! * Tip: Look around! The walls have intricate art that tells stories! As mentioned in other blog posts, we visited during the off peak season. 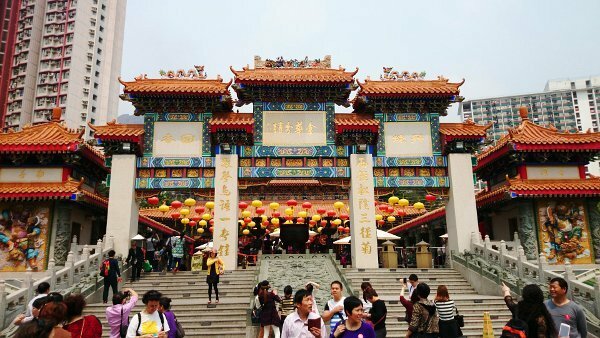 We heard that Kek Lok Si is a magical wonderland of lights and colors during Chinese New Year. During this period, the temple stays open until late at night. 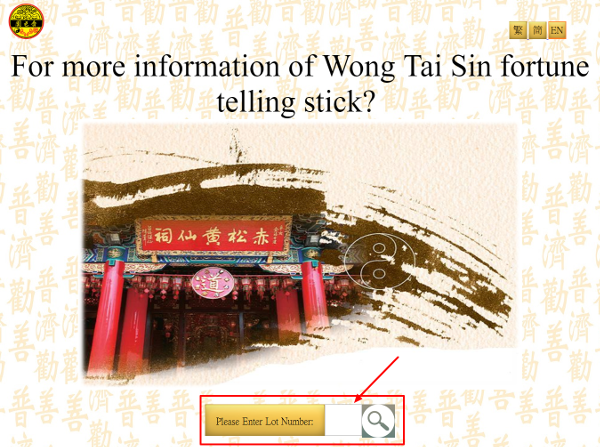 If you can time your visit, best to do so during Chinese New Year. 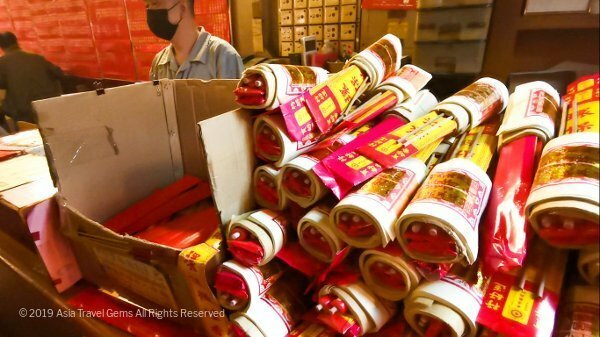 For me, it is a little difficult to plan because Chinese New Year is a big festival where I am from. And I am obligated to stay at home with my family during this time. 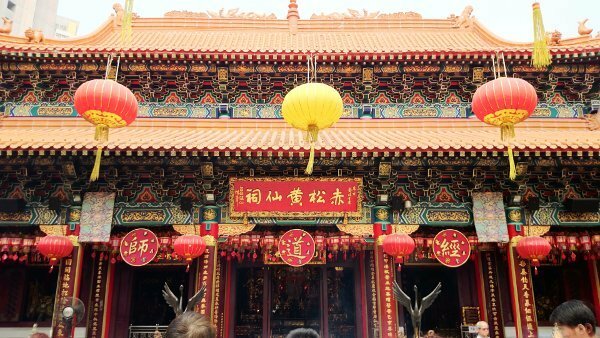 Still, Chinese New Year or not, Kek Lok Si Temple is indeed a place you must visit when you are in Penang. 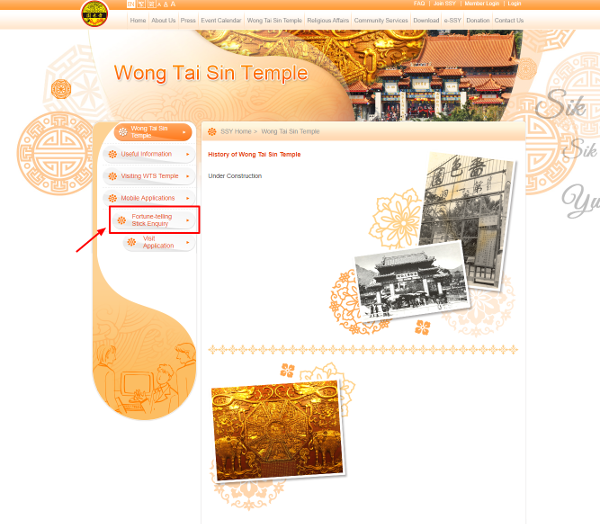 Where is Kek Lok Si Temple? 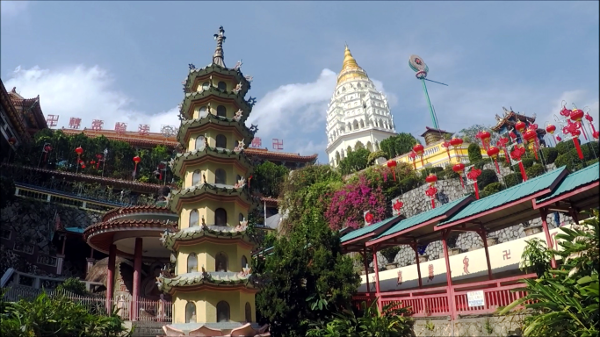 Kek Lok Si Temple is located at Air Itam mountain in George Town on Penang island. It is near and faces the sea. 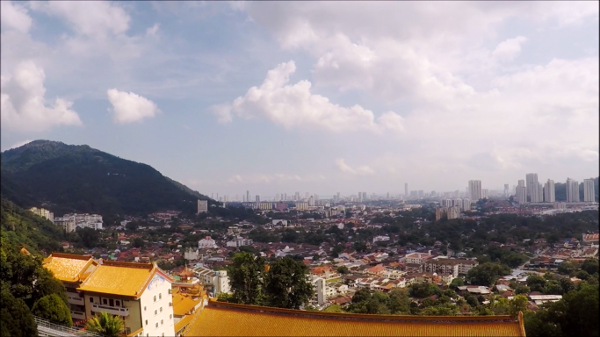 As such, the heights at the temple can offer impressive views of Penang. 9 am to 6 pm, Daily. Free to enter temple grounds. 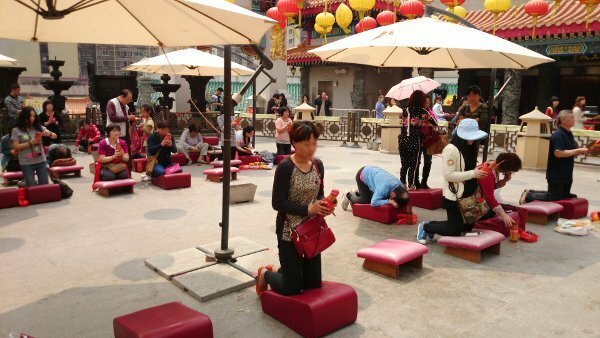 You have to pay to visit the Pagoda of Ten Thousand Buddhas, and use the inclined lift to the Giant Kuan Yin Statue. Prices change over time. Best to find out when you are there. Best to travel there by bus, car, taxi or Grab. See below. This is a small town. There are no train services. And there are no trains to this place. There are local buses, but information on their routes and stops are not well provided. Also, the journey by bus is quite a convoluted one and takes up a lot of time. Better to go by car, taxi or Grab. If you drove to Penang, you are at an advantage. Traffic is not as heavy as cities such as Kuala Lumpur. Navigating around is easy, especially if you have Waze app. There is ample car park lots in the temple. 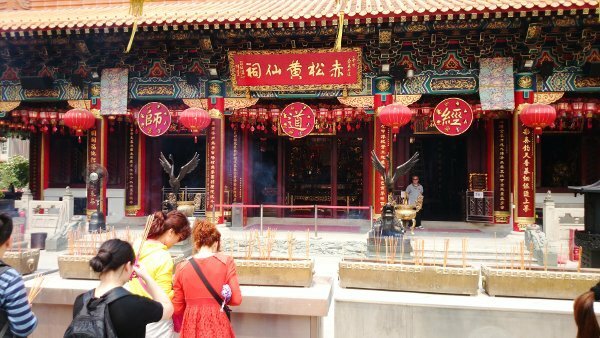 If you have ANY questions about this article, about Things To Do In Penang – Kek Lok Si Temple, ANY at all, please submit your questions as comments below. I will be happy to help you out. 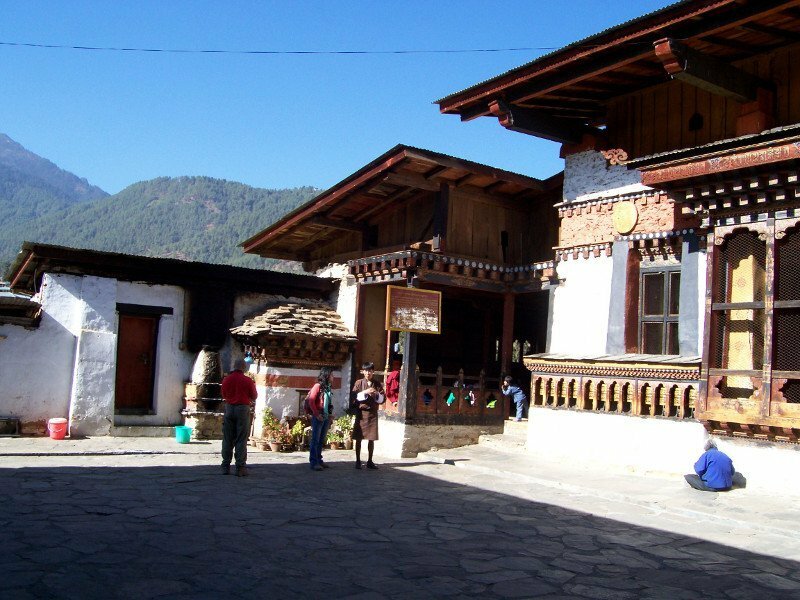 Another Best Places To Visit In Thimphu Bhutan is a temple known as Changangkha Temple or as the locals call it – Changangkha Lhakkhang. 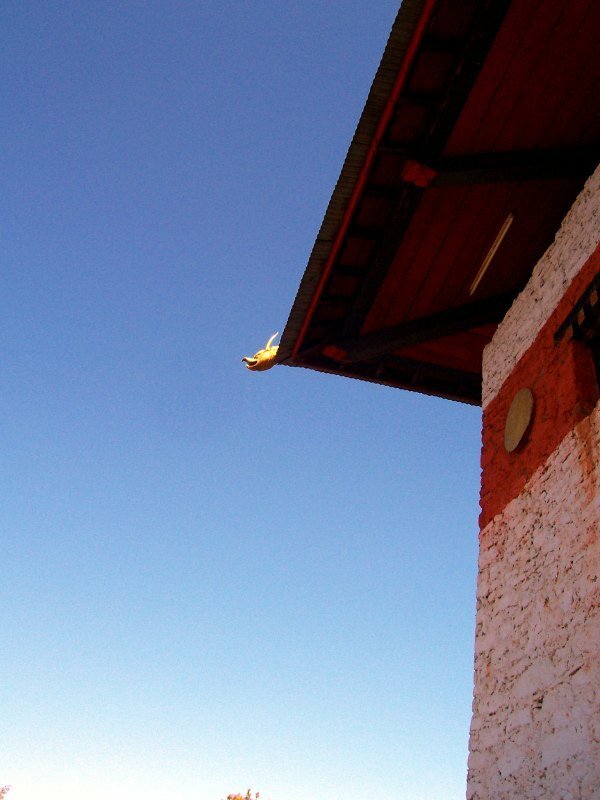 When I was in Bhutan, I stayed at a friend’s place and we could see the temple from his home. 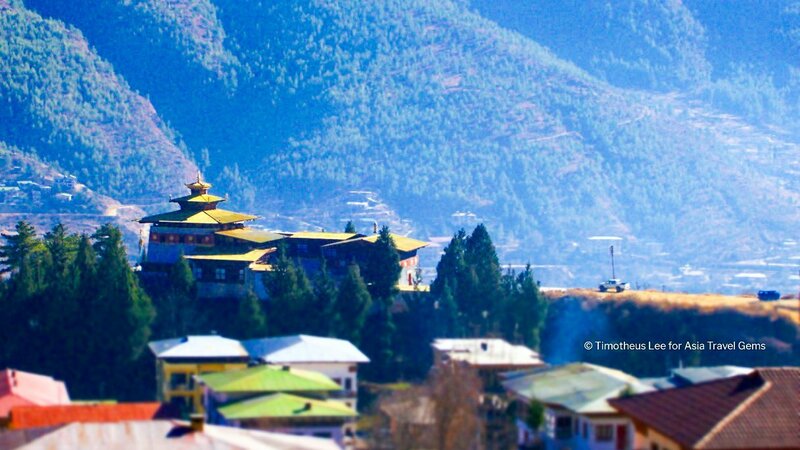 He told me that this is one of the more popular temples in Thimphu, Bhutan where many pilgrims and locals visit. 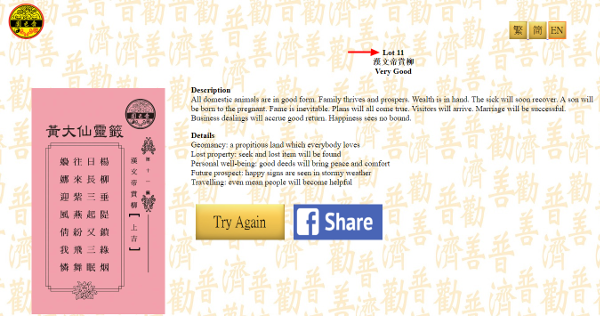 New parents would go to the temple to get auspicious names for their newborns or blessings for their children. 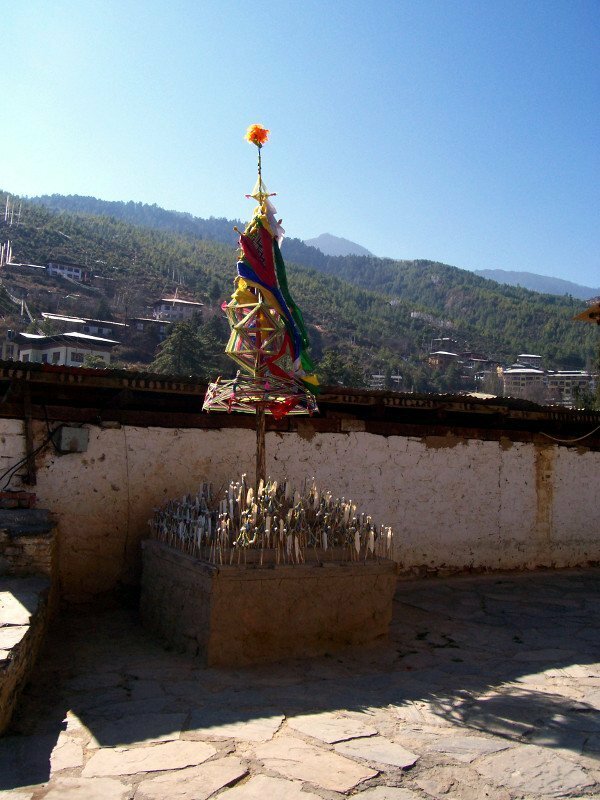 A more important reason was that the temple was the oldest temple in Thimphu. 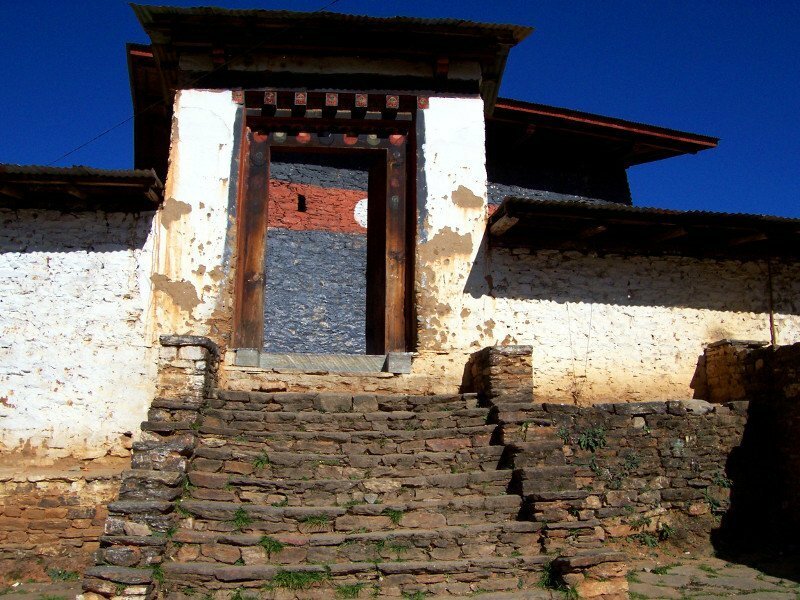 It was built in the 12th century on a ridge above central Thimphu. 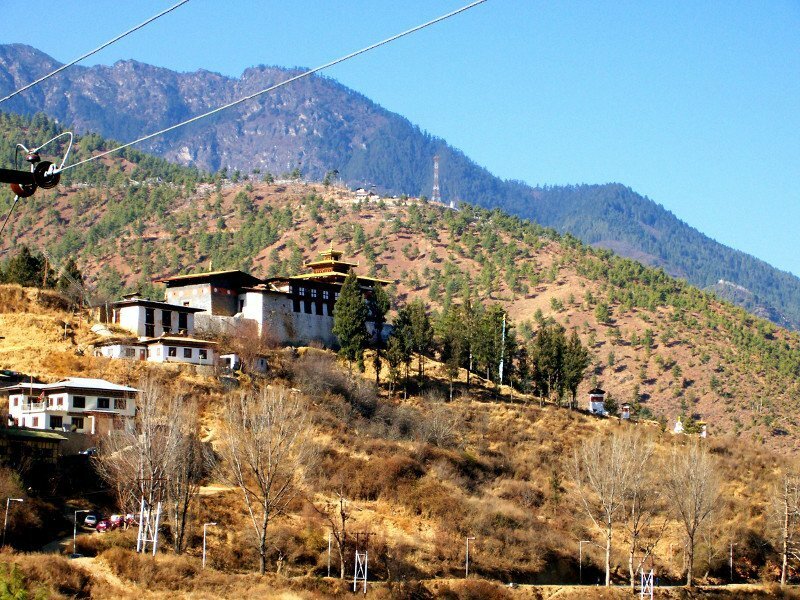 The temple offered a picturesque view of Thimphu Valley. On New Year’s Eve of 2008 I decided to make a trip to the temple. I would also receive blessings for the new year. Perfect! Here I share my adventure and journey to this wondrous place. With the temple in sight, I started the trek on a road towards that direction. You could see it in the distance, with its yellow roofs against the green mountains. 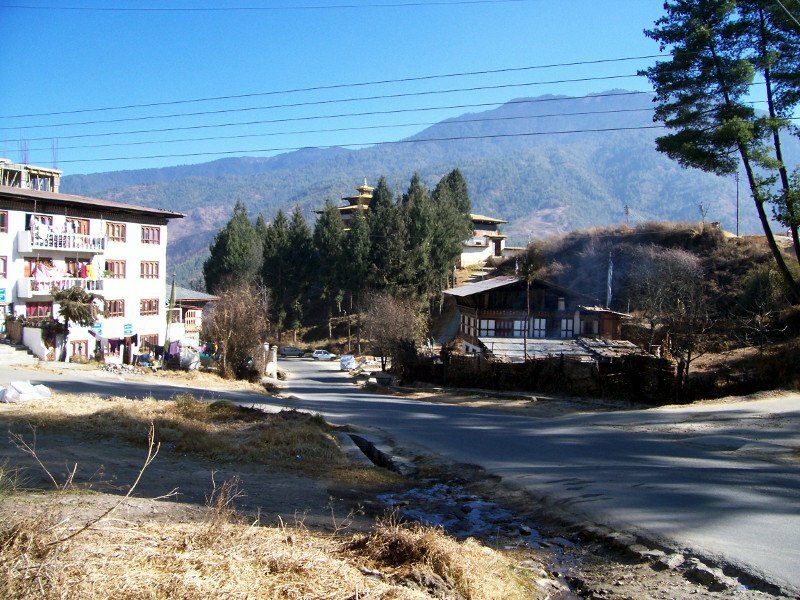 * Helpful Tip: Bring at least 1 bottle of water along with you wherever you go in Bhutan. The air is dry. And even during winter, the sun shines hot during the day. Plus, there are convenience stores but they are few and far between. The walk from my friend’s home was not too far, about an hour or so. To be honest, I was walking very slowly as I enjoyed the view, admired the local houses, watched prayer flags flapped in the winds, looked far at the mountains, and so much more. Soon, I reached the bottom of the ridge where Changangkha Lhakkhang was located. I loved how the highest roof of the temple seemed to peek from the top of the tall green trees. Like a shy and gentle giant observing a guest approaching. At the bottom of the ridge, there was a quaint little sign that said welcome to all guests to Changangkha Temple. Please do pardon the grammar. Actually, it does add to the charm, don’t you agree? 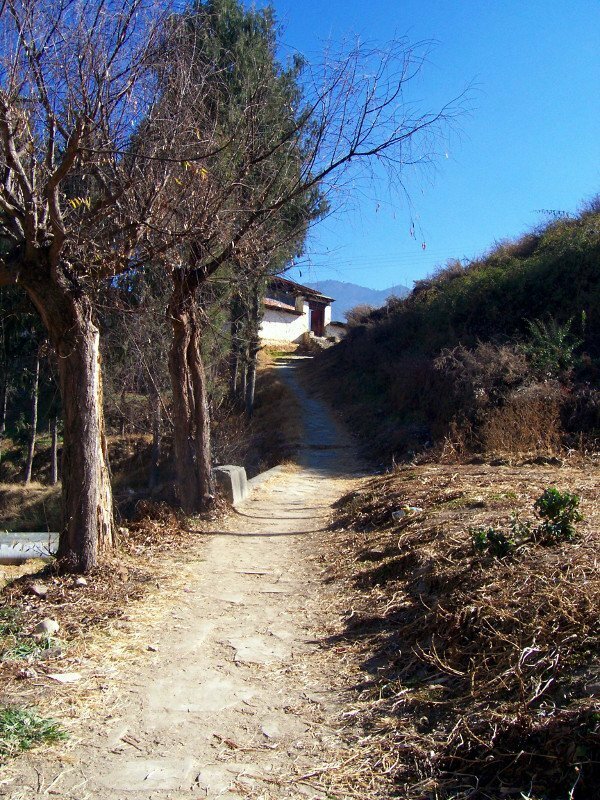 Now, the long and steep trek to the top of the ridge where Changangkha Lhakhang was at. Just kidding. 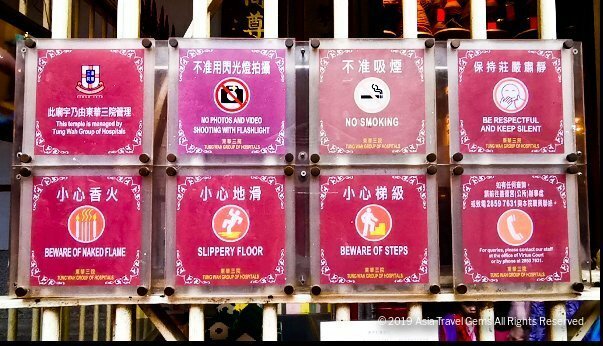 Actually, the walk up to the temple was short, and not steep at all. Not like the trek up to Radio Tower Hill, which I will share soon (whew! just recalling that trek makes me feel tired … haha). I reached the entrance to the temple. I must say the entire entrance structure, the way the huge walls stood at the side of the door made the entrance look impressive. One could feel awe, and that was just the entrance. Wait till you see the place inside. I stood at the bottom of the steps to the entrance, and I knew I had to take a photo. There was a lavender-painted brick building just behind the door, and it created an interesting composition to this photo. 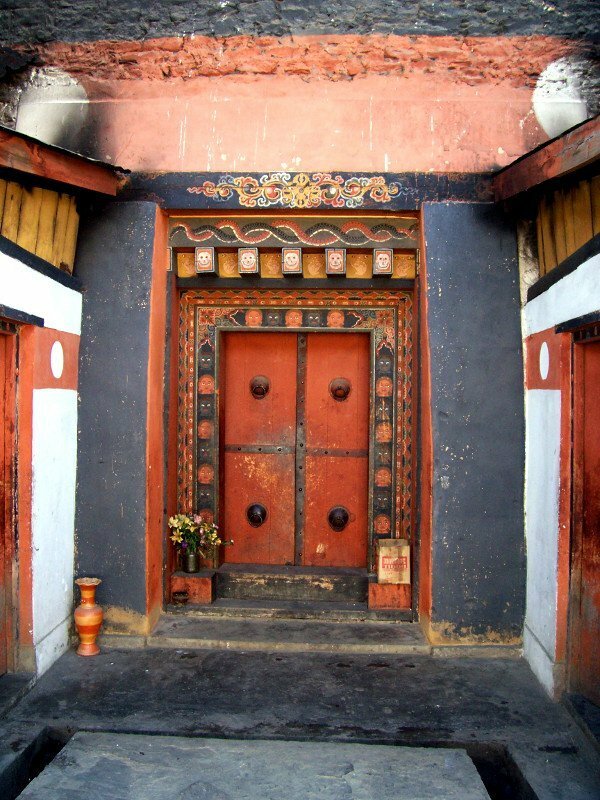 The doorway was made of wood with traditional Bhutanese carvings and paintings. I loved how the steps look worn. I imagined the thousands of pilgrims and followers that tread on them over the past hundreds of years. I found it charming how the steps sunk lower at the middle area. And the tiny grass and plants that grew from the gaps just made it all more charming. Each piece of brick were uneven in shape. Not like the evenly cut bricks we are so used to. And I found that endearing as they were surely handmade. I had many friends who told me how much they liked the photo below. Honestly, I still believe the shot I took could never do justice to the break-taking sight that stood before me when I entered the outer courtyard. Nothing beats being there. I remembered stepping into the courtyard and noticed this amazing sight. I walked closer to the edge and could feel my entire being soaking in the awesome scene. My eyes relished the colors, the expanse, and the mountains that seemed to go on forever into the blue. There was a pleasing sound of silence that added to the peace which permeated the entire space. Added to that, the fresh cool mountain air made the experience unforgettable. There are things that you remember all your life. This is one of those. Here is the fantabulous view of Thimphu Valley from the temple courtyard. Gorgeous, isn’t it? In the same outer courtyard, there was a religious structure. It looked fascinating to me. Strings of colourful threads and cloths were wrapped around it. On closer inspection, I wondered if these were from Prayer Flags? And why were they spun thing this structure? I never really found out about this though. There was a wall of lavender colored bricks with a thick red stripe going all across the building, with large white circles. The building was large and imposing, and this side of the wall faced the outer courtyard. Later, I learned that this building stood in both inner and outer courtyards. Take a look later, and see what I mean. At the side of the huge lavender-bricked building there was a little door that led to the main courtyard and main prayer hall. 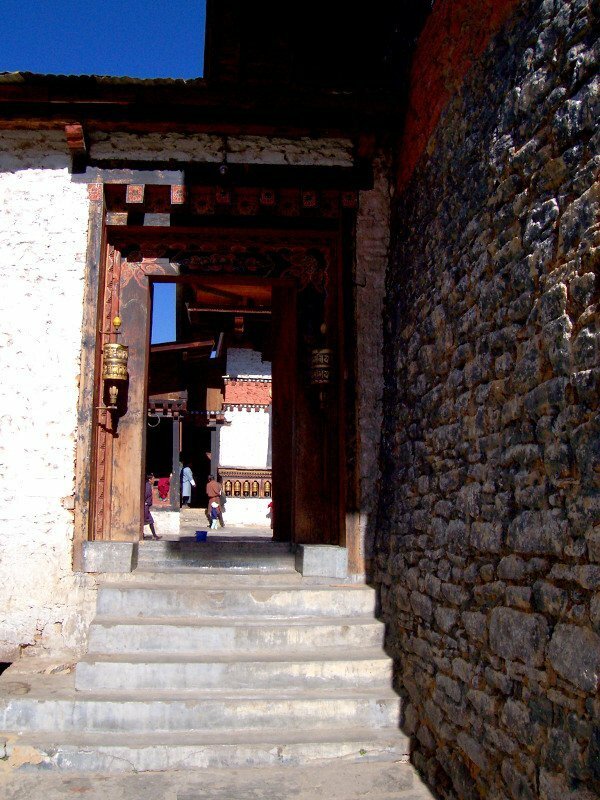 The doorways were always so ornate with traditional Bhutanese designs and so colourful. 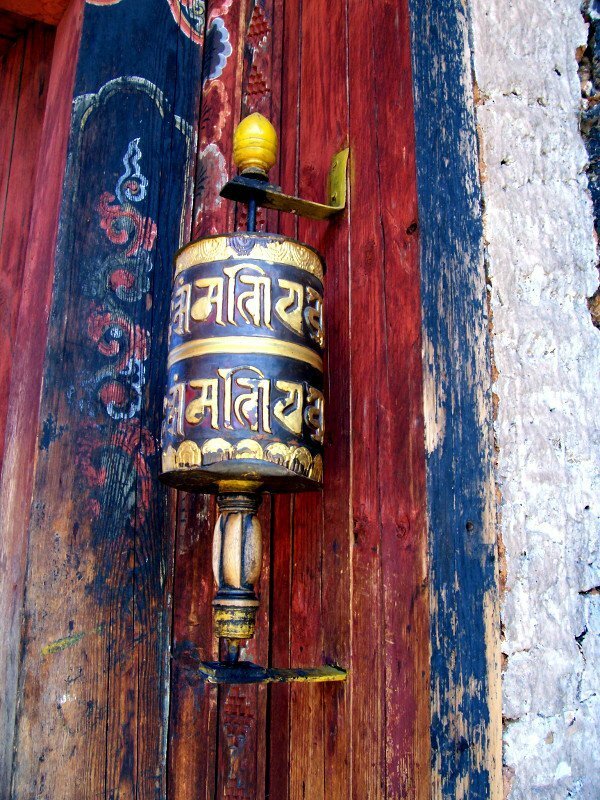 There was even a Prayer Wheel at the doorway for people to turn for blessings and good luck. You can read more about Prayer Wheels in the Clock Tower Square post where I explained a little more about Prayer Wheels. At the main courtyard, I noticed the wall of the lavender-bricked building that faced the courtyard had a door. This time it was not just a doorway but there was an actual door. Look at the intricate traditional Bhutanese art and decorations. It was so colorful. I was sure each design has a meaning to it. Unfortunately there was no one around to explain to me. There were some pretty flowers at the entrance. I think I kind of know what is inside. Can you guess what it is? Looking away from the lavender-bricked building, we now see the main courtyard of the temple. The main prayer room was the building on the right side of the photo below. The temple was quiet with only a few visitors that morning. There were a few tourists with a local guide. When I was taking photos the guide kept staring at me. It was a little uncomfortable and I wondered why. I mentioned it to my friend later and he explained that the guide was most probably wondering why I am all alone touring the site. 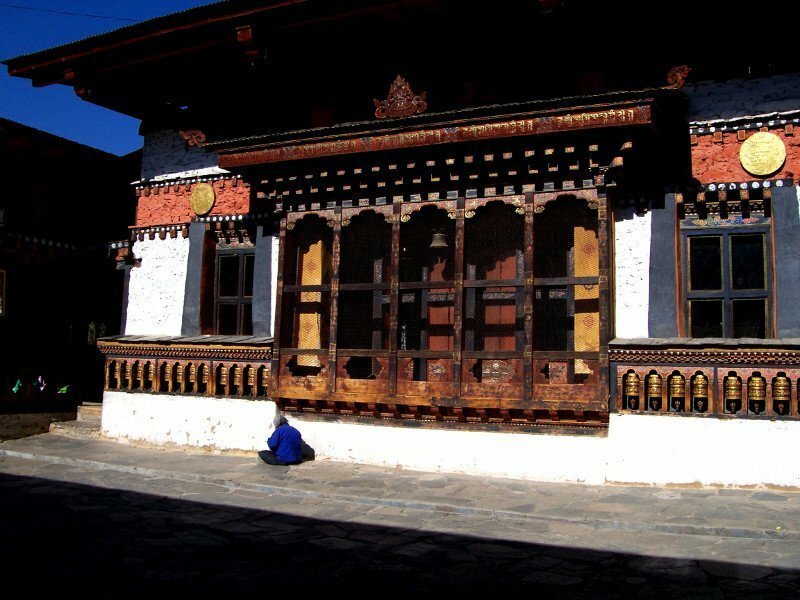 You see, in Bhutan visitors are not allowed to move about on their own. There must be a tour guide assigned to each or a group of tourists. 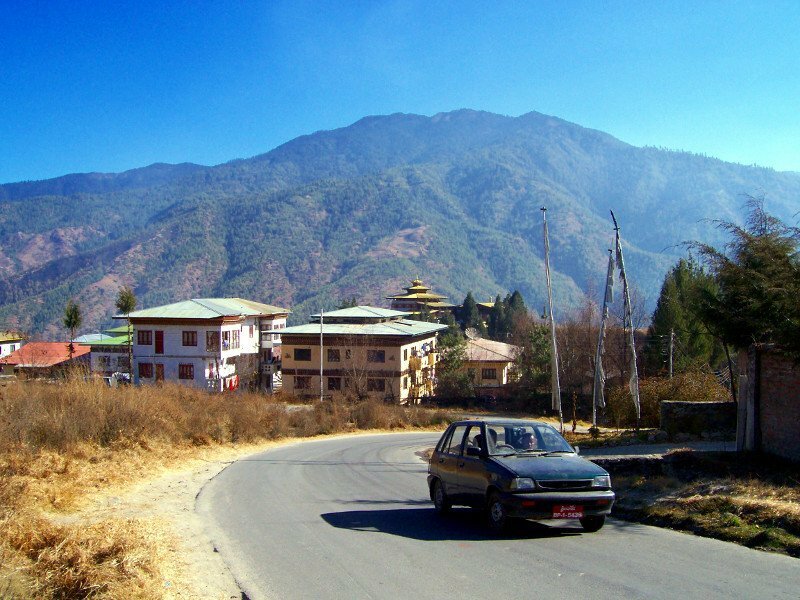 So please make sure you have a designated your guide when you book a vacation in Bhutan. In my case, I was invited by my friend who was working for the United Nations. So I was on a special visa. So I did not need to have a guide and was free to travel anywhere in Bhutan while on this special visa. Here is the full view of the front of the Main Prayer Hall. 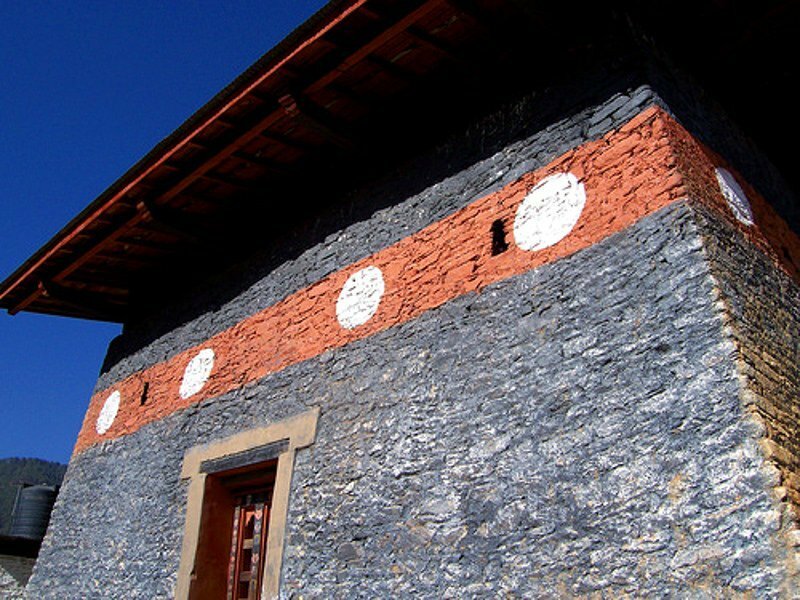 As with any of their architecture, you can see beautiful traditional Bhutanese design and decorations. 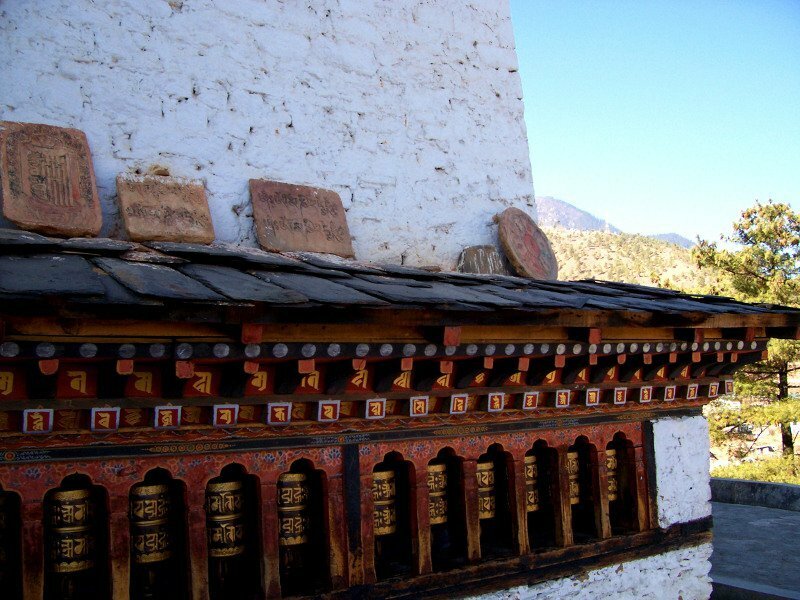 There were Prayer Wheels for people to turn them as they walked towards to the hall. An elderly man dressed in blue was chanting and praying as he sat on the floor, walked a bit, turned the wheels, walked a bit and sat again. It was their way of showing devotion to the gods. 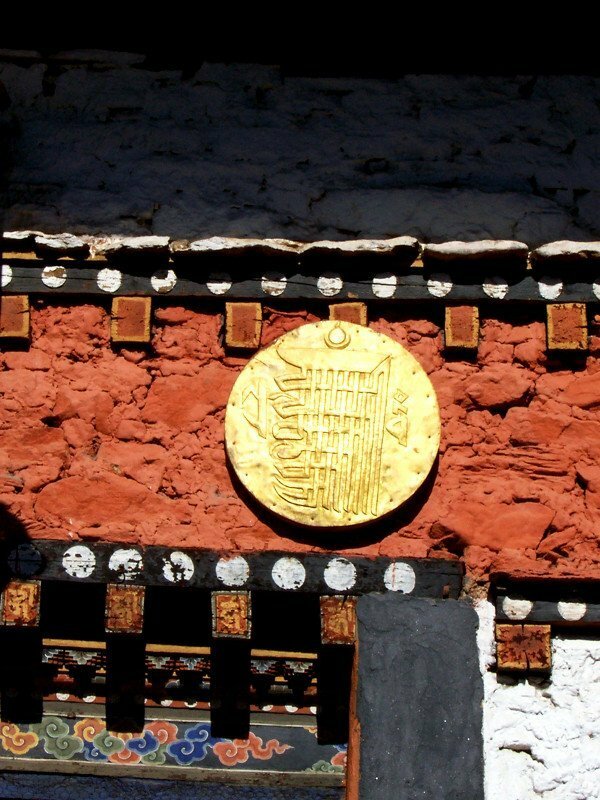 Also on the front of the Main Prayer Hall, there were 2 gold discs with the Kalachakra image on it (see photo below). The Kalachakra motif, also known as the Tenfold Powerful One, is the most potent and best known symbol of the Kalachakra system in Buddhism, particularly Tibetan Buddhism. In Sanskrit, ‘Kala’ means Time, and ‘Chakra’ means Wheel. That is why Kalachakra is often perceived as Time-Wheel, which also means Time-Cycles. Without going into too much details, basically the meaning of this revolves around the concept of time and cycles. Everything is influenced by time, and the wheel represents an endless cycle with no beginnings or endings. The symbol also consists of a ten syllable mantra – OM AH HUM HO HAM KSHAMALA VARAYA HUM PHET. Each syllable has a meaning. Again, without going into too much details, here are a couple of examples; HAM refers to the Enlightened Wisdom of the Mandala Deities, and KSHA refers to the Body, Speech and Mind of the Deities. On the left and right of the Kalachakra symbol are 2 characters that stand for E and VAM. E means Emptiness, and VAM means Bliss. Together, they represent the union of the two concepts. To the left of the Main Prayer Hall, there was a passageway into the hall. But before that, there was a lovely little altar (see photo below). For some strange reason, I was very drawn to this space where the altar has been constructed outside the Prayer Hall. I found it very pleasing. All throughout the time as I explored the main courtyard, I could hear bells ringing once in a while. I wondered what they were? As I walked into the passageway, I discovered the source of that. Ahhh … so this was where the sound of ringing bell came from. That was a huge Prayer Wheel! It was so large that ropes were tied to the bottom for people to pull and turn the wheel! The wheels were painted with holy Buddhist text. * pls pardon the low quality video. I did not have a good camera back in 2007, and HD was not available yet. Rest assured, I have a good camera since, and other videos and photos from this time on are of high quality. Once inside the prayer room, no photography or video taking was allowed. 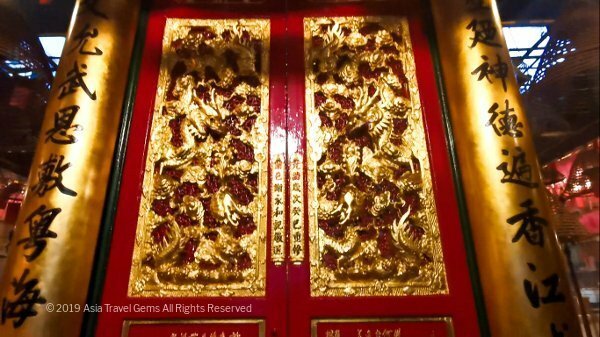 I stepped into the prayer room, and entered into a small rectangular hall. As I entered the prayer room, the doorway to the altar room was to my right. 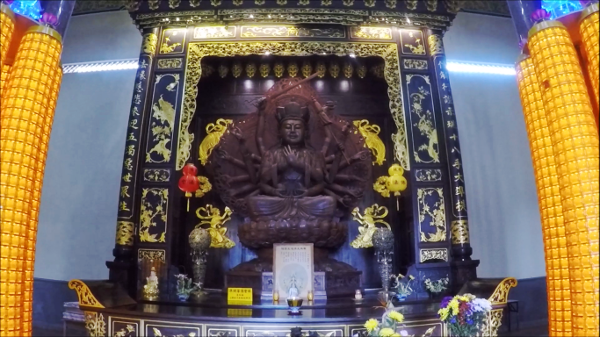 A huge statue of Avalokiteshvara, the Buddhist emanation of Compassion was inside, raised on a table/platform. The statue was so gigantic that when one stood just outside the doorway to the altar room, one could only see part of the head of Avalokiteshvara. See the drawing below that I drew (the best I can from memory) of what I saw. 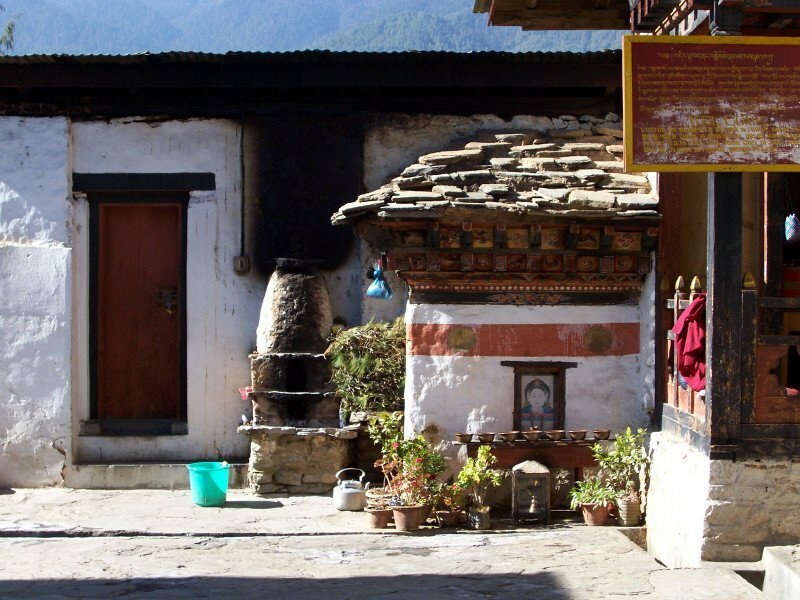 The people of Bhutan believe that Avalokiteshvara at Changangkha Temple is able to answer all questions, and makes all wishes come true. 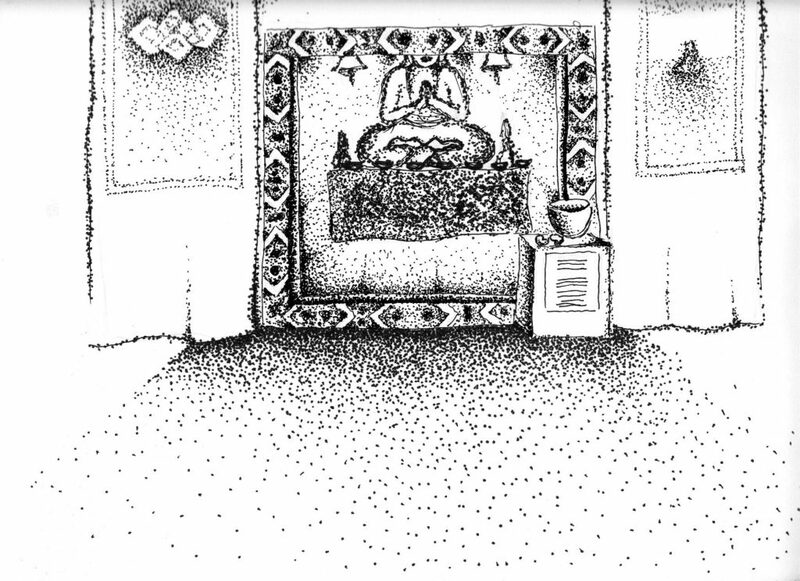 At the doorway of the altar room, there was a yellow box (see box in drawing shown above, on the right side of the doorway). 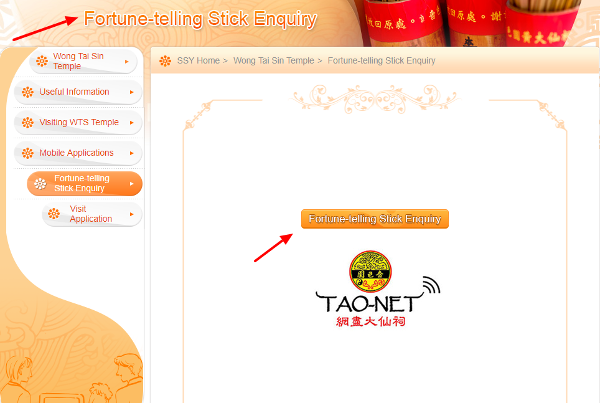 People who have questions or wishes would consult a monk who would be standing by the box. 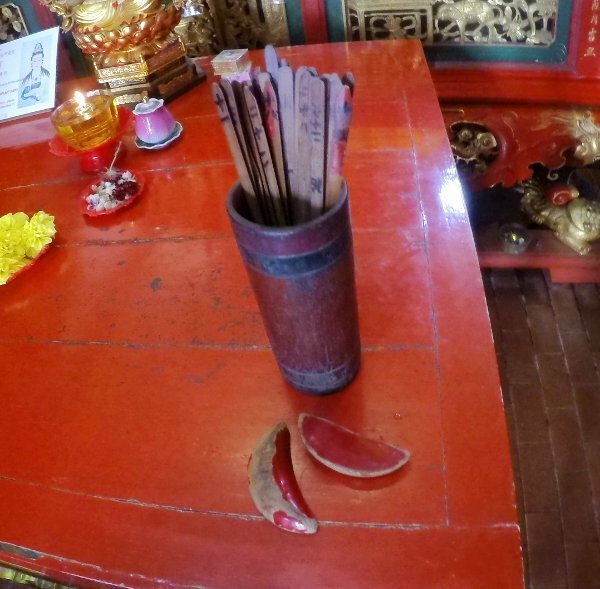 The monk would then gesture for the enquirer to take the divination blocks and cast them on the yellow box. The monk looked at the position and facing side of the divination blocks, and informed the enquirer whether his or her question would be answered or wish would be fulfilled. Any negative response could be resolved with the help of the monks. The enquirer would place a donation into the large bronze bowl that was on top of the yellow box. At the front of the yellow box, there was also a sign. 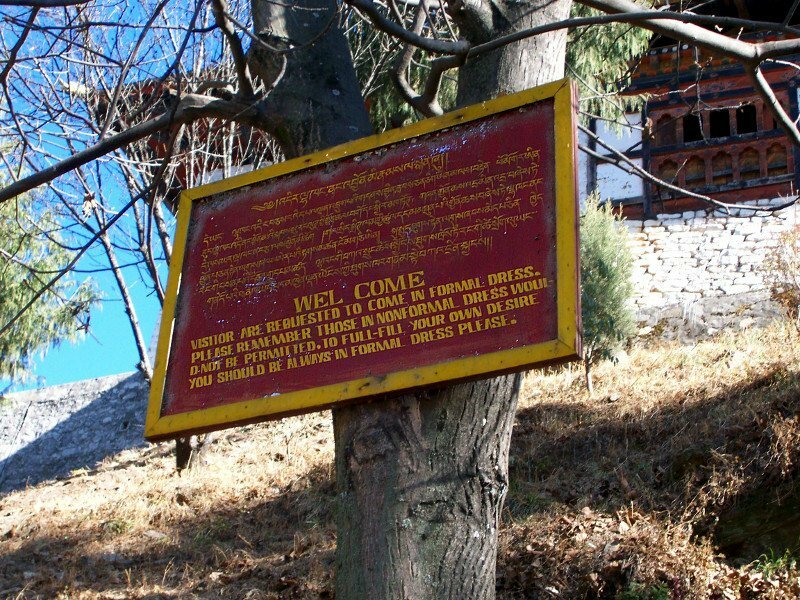 The sign gave a bit of the history of Changangkha Lakhang, built in the 15th century. It also mentioned that the monks would like to expand the temple. As such, any donations would be welcome. All donations were placed into the large bronze bowl. I noticed there were pieces of cloth (possibly thangka?) covering the walls. Some of the cloth were curled up at the edge. I moved closer to take a peek, and saw a very small portion of what looked like a large painting. Too bad they covered it. I was sure it would have been very awesome to see the entire painting that was on the walls of the prayer room. To the right of the prayer room, there was a raised platform that faced the doorway of the altar room. In front of the raised platform was a table with a large book, and religious artifacts. On the cover of the large book was a title in English that said it was an astrology book. I supposed that was where people could consult a monk about their star sign, and what the future held for them. After the experience of being in the Prayer Hall, I just felt I needed some air. To be outside, and feel and breathe. So I walked to the perimeter area. 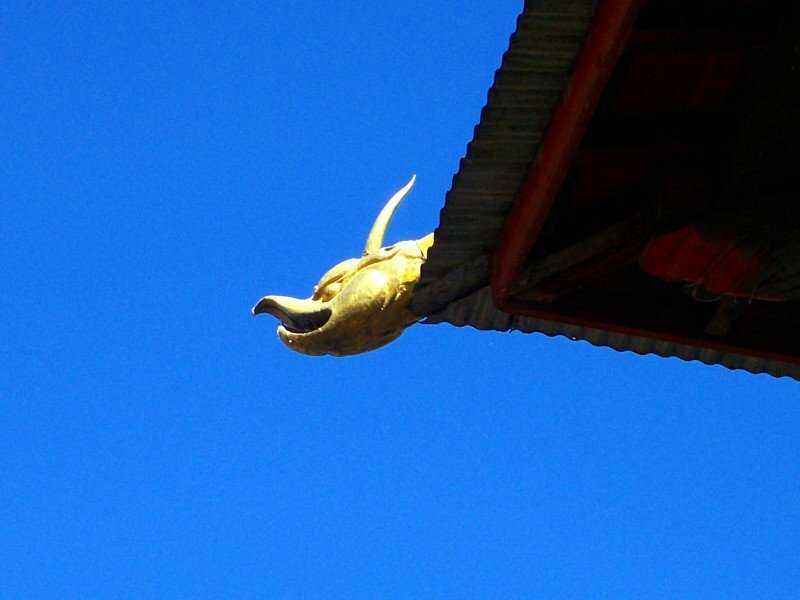 Looked up, and saw this gold statue of a head with bird’s beak at the corner of the temple’s roof top. 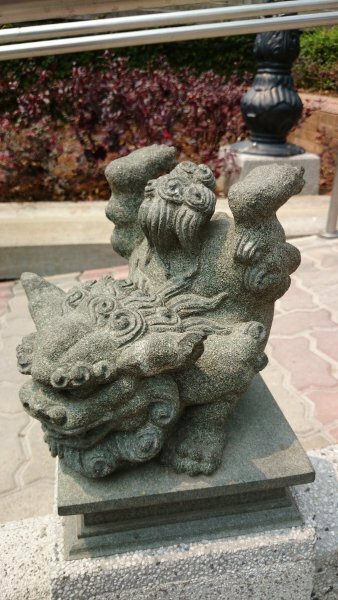 Reminded me of the ‘garuda’ – creature with bird’s head, and body of a lion. Wondered if this served the same purpose? A closer view of the gold heavenly creature. Interesting, isn’t it? 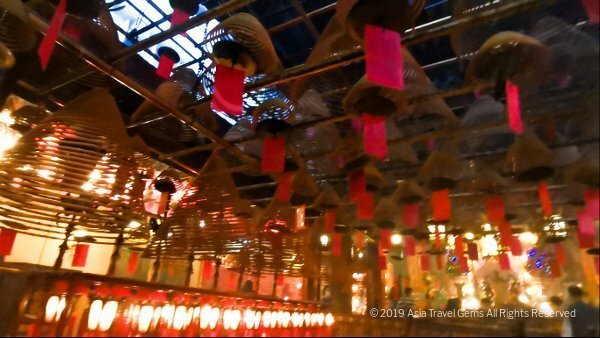 Along the perimeter, there were rows of Prayer Wheels that do not seem to end, that seemed to circle the entire temple. Again, for more info about Prayer Wheels, please read my article about Clock Tower Square where I shared a bit more info about this. There were shy local Bhutanese women turning the Prayer Wheels. Watch the video below. All too soon, it was time to take my leave. It was a really pleasant visit, and I did enjoy seeing the temple a lot. As I walked down the path away from the temple, I glanced back. This will surely be a memory that will last a lifetime. Just as my friend highly recommended Changangkha Temple, so do I highly recommend it to you, too. 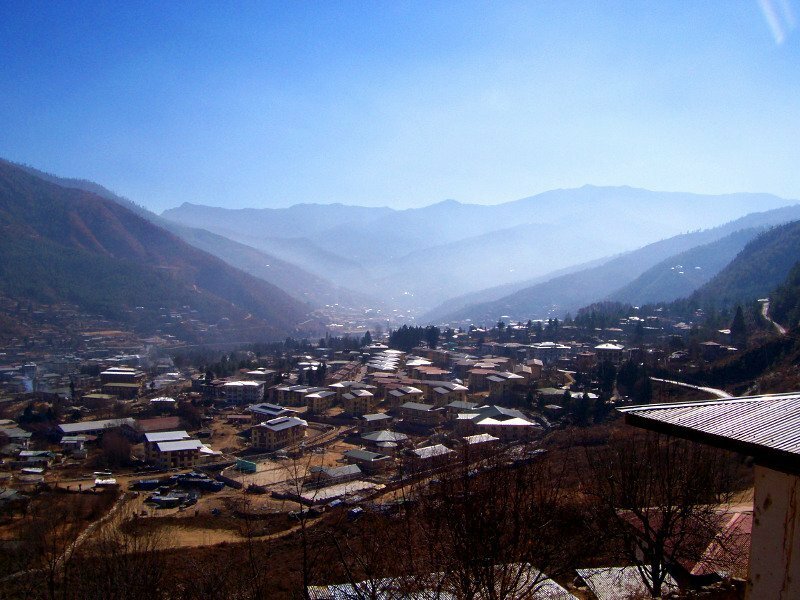 When you are in Thimphu, Bhutan, you must add this place as part of your travel itinerary. 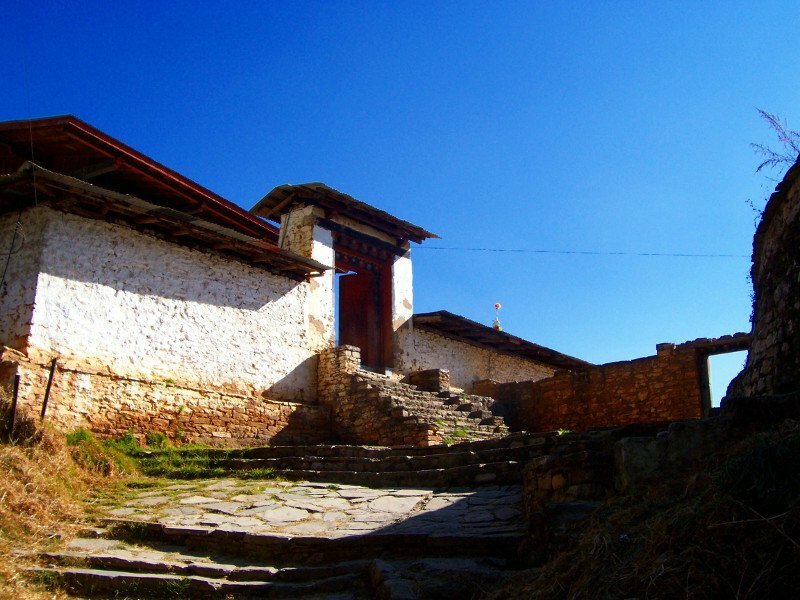 If you have ANY questions about this article, about Best Places To Visit In Thimphu Bhutan – Changangkha Temple (aka Changangkha Lhakhang), ANY at all, please submit your questions as comments below. I will be happy to help you out.